After posting about the Colonial Marine that I painted, I got a few requests for a tutorial on how I painted him. Since I was looking for one when I started, and ended up doing a bit of research on the subject, I figured I’d make a tutorial myself. 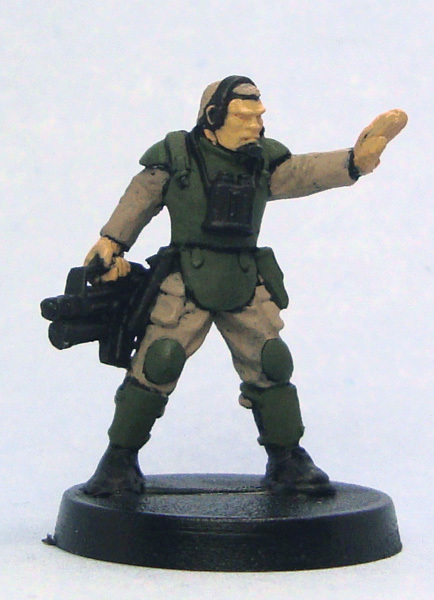 Probably spurred on by the release of the new edition of Space Hulk, there’s a surprisingly large number of people gaming the Aliens universe, so I hope this is of use to someone. 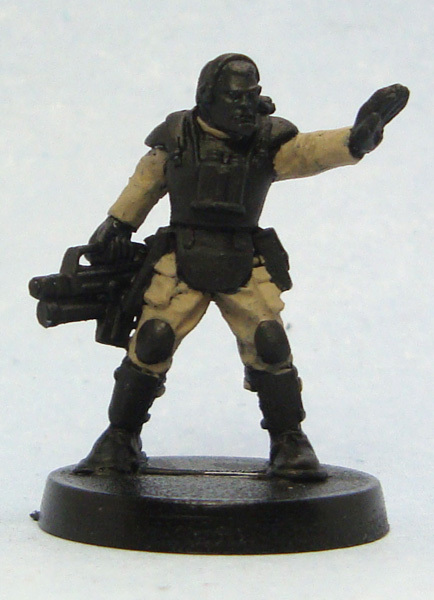 And even to those not painting Colonial Marines, this tutorial details a simple way of painting a fairly generic scifi trooper. Since I’m not a pro painter by a long shot, this tutorial should be fairly easy to follow. There’s no wet-blending, NMM or fancy stuff like that. Throughout this tutorial you can click on photos to enlarge them in a new tab. As you’ll probably notice, the colours vary from photo to photo a bit. This is due to the fact that I shot the photos whenever I did some painting, meaning some were taken in bright daylight while others were taken in the middle of the night, not to mention using wrong camera settings etc. Photoshopping them all consistent would’ve been a huge chore, so I chose to live with them. I hope you can too. You can’t have a tutorial without a miniature to paint. 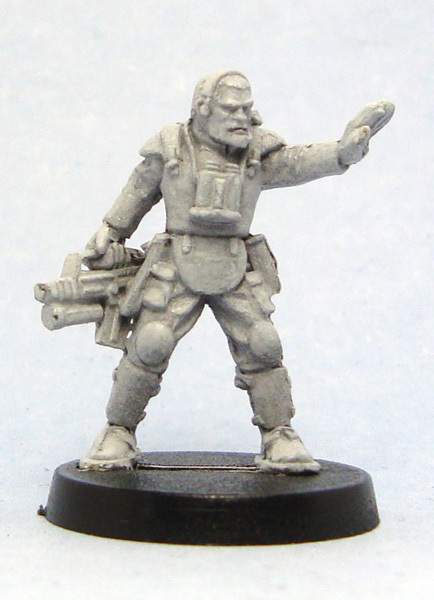 As I posted earlier, I’ve picked Mark Copplestone’s scifi troopers (available from em4, Copplestone Castings and Mirliton) as my Colonial Marines. 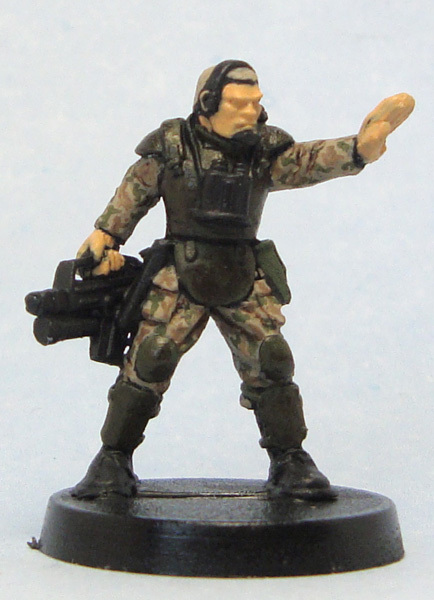 This particular miniature is a a trooper from em4. The second thing I did was look for reference material. It’s a surprisingly simple step that is often neglected. Simply by browsing pictures of what you’re about to recreate helps you immensely. With Google’s image search, this couldn’t really be any simpler. I simply typed in “colonial marine” followed by “armor/weapons/bdu/etc”. If you’re really lazy, you can just click here. 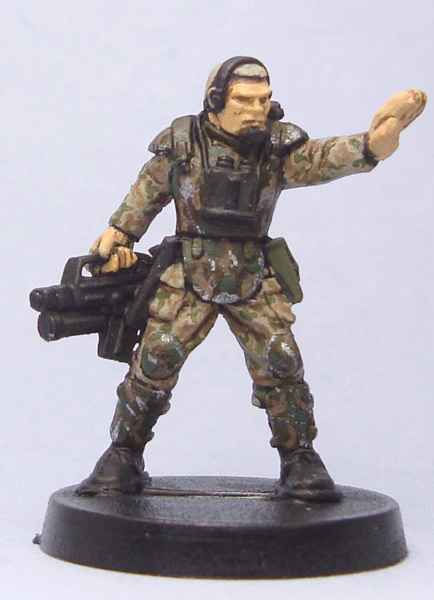 The internet is full of people collecting movie props and replicas, which helps miniature painters to no end. Em4’s miniatures come ready with a grey basecoat. While this is usually really helpful, I’m completely rubbish at painting over anything other than a black basecoat. This was quickly remedied with a touch of black paint. 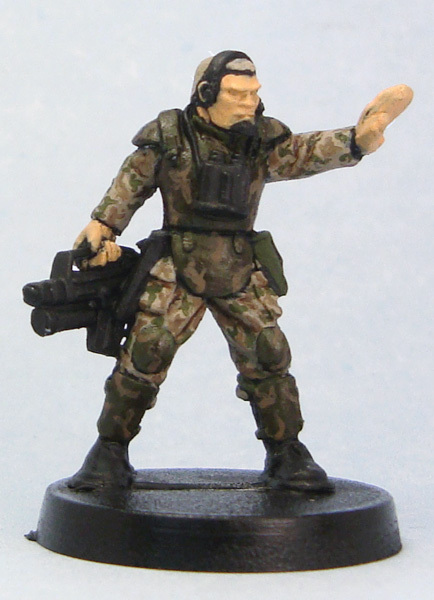 Next I painted the BDU (Battle Dress Uniform) with VGC (Vallejo Game Color) Khaki. Nothing special here, being neat helps. I then painted the trooper’s armour, armour straps and the pouches on his belt with VGC Cayman Green. As you may have noticed, what I’d interpreted as being the collar of the model’s BDU turned out to be a part of the armour. Probably. Don’t you just hate things like this? Next came the skin, using Citadel’s old Bronzed Flesh. This is an old paint that I have, and I believe it might’ve been licensed from Coat d’Arms. The hair was painted with VGC Khaki. Painting camo tends to put people off for some reason. I don’t really understand why! It’s time-consuming of course, but it’s also really simple. 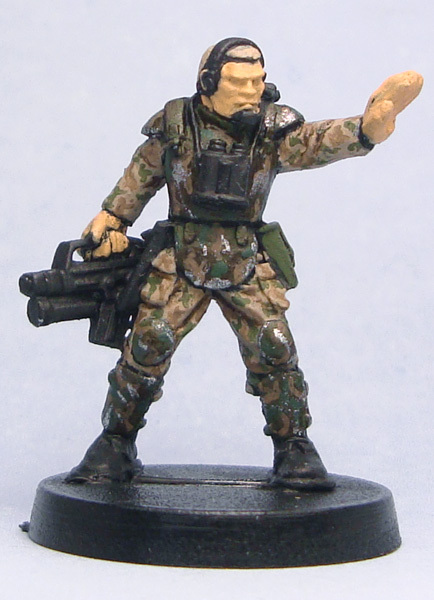 I started with Citadel Graveyard Earth, and simply painted small irregular patterns/blotches on the BDU. I left fairly much empty space between the patterns, since I’d still need to squeeze in a second colour. In this step I simply repeated the procedure of the previous step, using VGC Cayman Green. I tried to be as neat as possible, and not have the two camo colours overlap. And just like that, we have camouflage! As you might notice, for this picture I remembered to flick on my camera’s correct settings. To darken the armour a bit and to better bring out the folds in the BDU, I next gave the armour a thin coat of Citadel Brown ink and painted some of it in the cloth folds as well. The armor will usually look a bit messy. Don’t worry. It’s just a phase it’s going through. Checking the reference photos above shows that there’s camo on the armour as well. The patterns are a bit larger, so I took this into account. I used the same Citadel Graveyard earth paint as on the BDU. 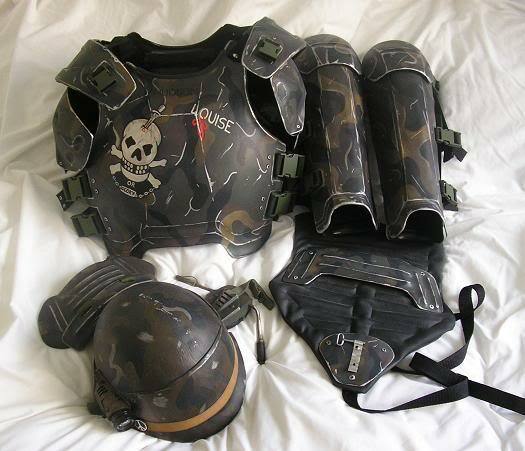 Note that I didn’t paint any camo on the armour straps. Next I finished off the armour camo by adding a second colour. The paint I used is an old Coat D’Arms one, and I have absolutely no idea of its name. It’s a darkish green, feel free to improvise to your own taste. A Colonial Marine’s armour is bound to get scuffed up a bit as he goes about the galaxy gunning down things, so my last step in painting armour was adding a little damage. I used Miniature Paints Chainmail, don’t know if you can find it anywhere. Any darker silvery metallic will do, though. I painted damage along the edges of armour as well as random scratches. Again the reference pictures are a great help. Since the skin was still flat at this point, my next step was to apply some Citadel Flesh Wash to the recesses, like between fingers, eyesockets etc. I finished off the skin with a highlight of Citadel Bronzed Flesh mixed with VGC Bone White, and the hair with a mix of VGC Khaki and VGC Off White. I like my highlights very subdued, and am not really a fan of the style of highlighting to pure white. I have to make a confession here. I hate highlighting black, and am sick and tired of it, especially after these guys. 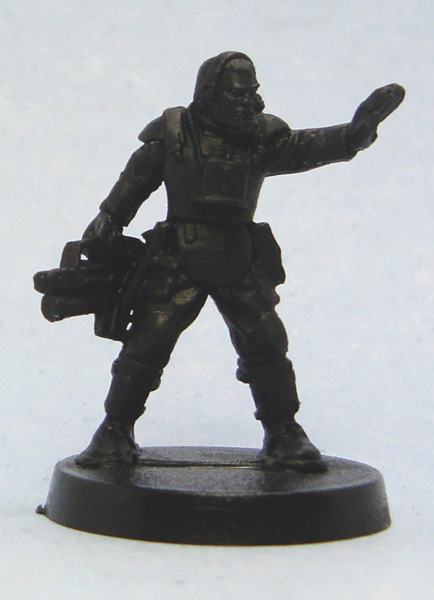 Because of that, I really took an easy way out here, and simply highlighted every black item (weapon, headset, boots, gun holster, binoculars) on the Marine with Citadel Codex Grey and smoothed it down a bit with Citadel Black Ink. It’s quick and easy and delivers a good enough result. The same mentality went into highlighting the green ammo pouches. I mixed a lighter highlight colour from VGC Cayman Green and VGC Off White, and highlighted the edges. I didn’t want the equipment to be focal points in the mini, so I didn’t spend much time and effort on them. Nearly there! I painted the eyes, based the model (sand, Citadel Fortress Grey, Citadel Black Ink, drybrush with Fortress Grey) and gave it a coat of gloss varnish followed by a coat of matt varnish to take away the shine. And there you go! 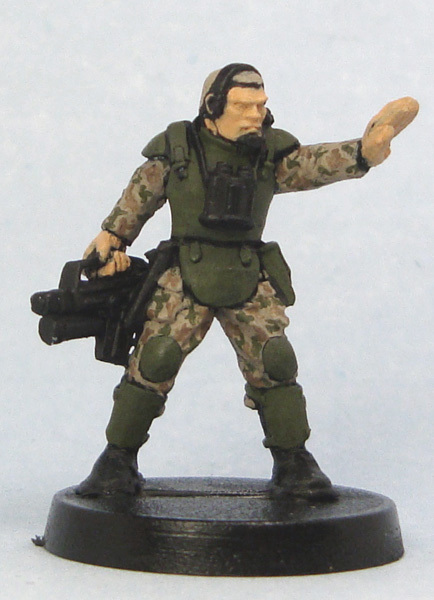 A happy little Colonial Marine ready to die gruesomely in the hands of your extra terrestrial of choice. I’d love to get feedback on this post. Of course, if you use this tutorial, I definitely want to see the results! That’s it. Game over, man, game over. I really like your tutorial, and the photos are much better than one would expect from your introduction. A problem I have with painting camo is spacing (especially with more than two colors…), and randomness (my camo often looks too arbitrary). Tutorials like your’s are therefore much appreciated! Thanks for the comment, it’s great to hear that it’s of use. The spacing is indeed a nuisance, especially if you don’t take it into account when starting out. A steady hand and tons of patience go a long way! Thats a great step by step tutorial Mikko, good job. I am one of those people that you mentioned who are reluctant to try to paint patterns on to figures. 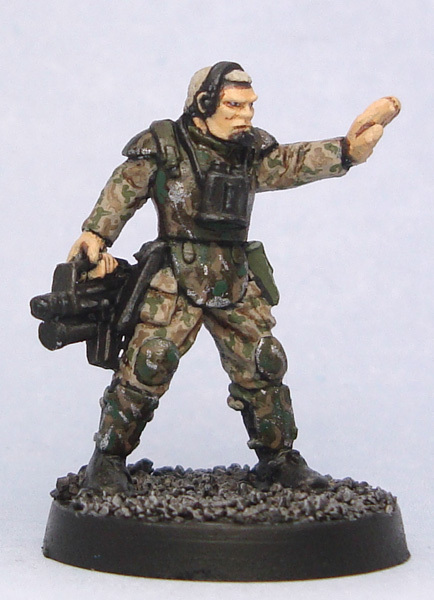 Recent sucesses in that area have encouraged me to have a go with some camo on my colonial marines. My Gripping Beast/Woodbine Colonial Mmarines are currently “in the post” and my Prince August/Future Shock Power loader is in my figure assembly area with my Hasslefree Signee and Billie figures (plus a Mega Minis “Jones”). Im in the pipe, five by five. I very much hope to get my long overdue “Aliens” project completed before the end of the summer. To that end I will be using a lot of the info from this tutorial (while inevitably putting my own slant on the process). I figured you might take a hint and get back to that lovely Aliens stuff I’ve seen on your blog 😉 I’m expecting pictures, Paul! The camo really isn’t that bad once you get the hang of it. It’s slow and boring, but the results are well worth it IMO. I’ve been trying to find an answer to this for weeks, what does “I’m in the pipe, five by five” actually mean – I get that the context of it means “I am on target”, but what is the ‘pipe’ – an entry trajectory? And, what is the significance of the phrase “five by five”? Thanks in advance for reading this, and I hope you can shed some light on this! Apparently a combination of two idioms. Hope this helps! Excellent, this is an inspiring post! It makes me wanna paint some colonial marines too, to go with my Horrorclix Aliens. 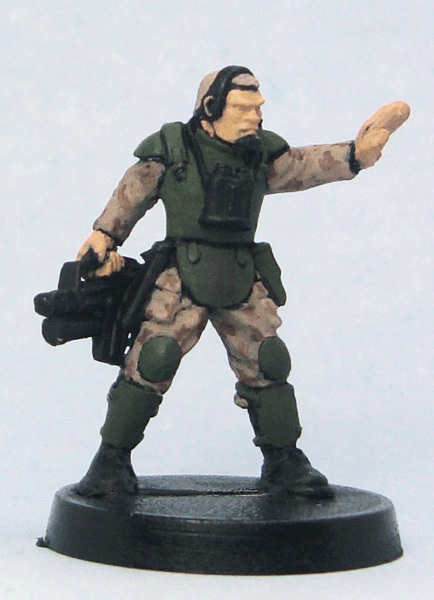 Unfortunately I don’t like the Ripley figure, but the marines are cool. Do you plan on using any particular rules for playing? Thanks for the comment Tobbe! The GB marines are slowly growing on me. Didn’t like them at all initially, but they have a certain cartoony charm to them. I like the tutorial. And your finished mini looks very neat! I got the miniature you used and I have nearly all the colours you mentioned. So thank you very much for this one! The new cartoon-CMs from Gripping Beast are so bad. Horrible! Copplestone is far better. It is a pretty good tutorial which I plan to link to, but I can’t help think you need to work on your skin tones a bit more. Everything else looks great. Thanks for the comment, Muskie! I completely agree with you. I’m terribly lax when it comes to doing flesh tones, especially on gaming standard paintjobs. I put some more effort in them when I’m painting stuff for RPGs etc, but you’re right on the money there. Awesome tutorial. I have a couple dozen Kryomek, Copperstone and EM4 mini’s lying around. Been trying to come up with a decent camo scheme for quite some time. I’ll send you some pics -but first, a paint shopping trip! Cheers Brian, glad to have been of assistance. Looking forward to seeing your painted minis! They’re up, The pics I promised are here. As you can see I decided to do a test-run of Urban War mini’s first. The shiny looking one was shaded with GW Gryphonne Sepia rather than Ogryn Brown. For some reason it resulted in a shiny finish. I had to chance a few paints. I couldn’t find Caymen green from the Vellajo Colour range so I used Military Green from the Vellajo Model Colour range instead. Seems to work okay. Very nice work there, Brian! By the way, kudos on your other painted stuff as well, looking great.